Because of some other technical issues we have to work in Unity 2019.2.0a8 and unfortunately on iOS when enabling Vuforia, it gives us a "brown" screen. We have disabled the "Auto Graphics API" and set it up to use "OpenGLES2" only. We have tested this same build for android and can confirm that it works there. I've uploaded the log to pastebin. We do realize that technically alpha's are not supported however it would be great if someone can help us point out the issue if it lies within our configuration of vuforia/unity. In advance thanks for your help! Your camera's clear flags are set to "Don't Clear". It should be set to "Solid Color", which is the default setting when you import the ARCamera. This could be related to which process is controlling the device camera. When Vuforia is initialized, it will attach to the camera as a singleton. Technically, no other process can access or control the camera while Vuforia is running. The corollary is also true (from my understanding) that if another process is attached to the camera, Vuforia cannot access it and the video background from the camera feed will not be rendered. Normally, this results in a black screen being rendered when trying to run Vuforia. My assumption is that Vuforia is controlling camera after app start and things work fine. However, when the app is backgrounded perhaps the native Unity takes control of the camera on resume? 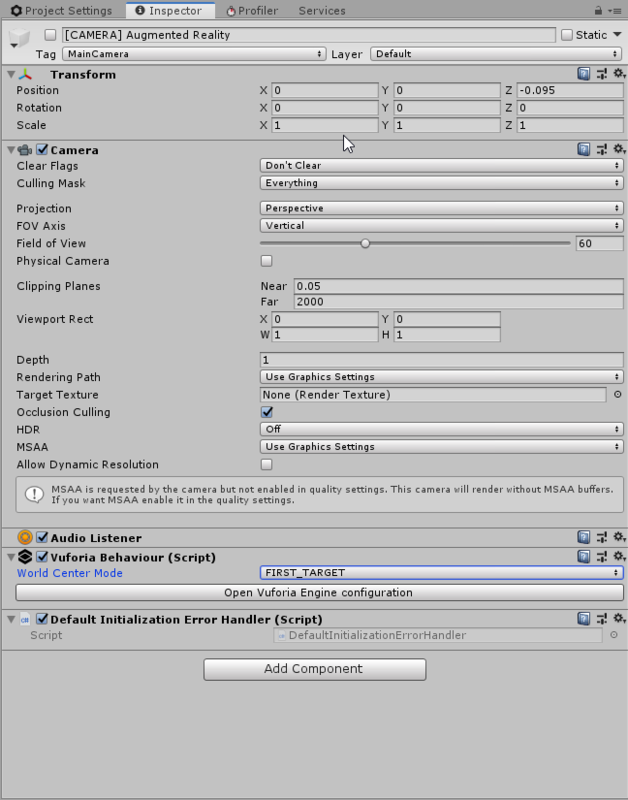 Perhaps you can use these (or Unity's) APIs to directly control the Vuforia camera during the app's lifecycle to insure "camera access collisions" do not occur. I didn't find many clues in the attached log, other than it looks like Vuforia crashed at some point. Are you trying to use the native camera (Camera Game Object) in conjunction with the Vuforia ARCamera Game Object?